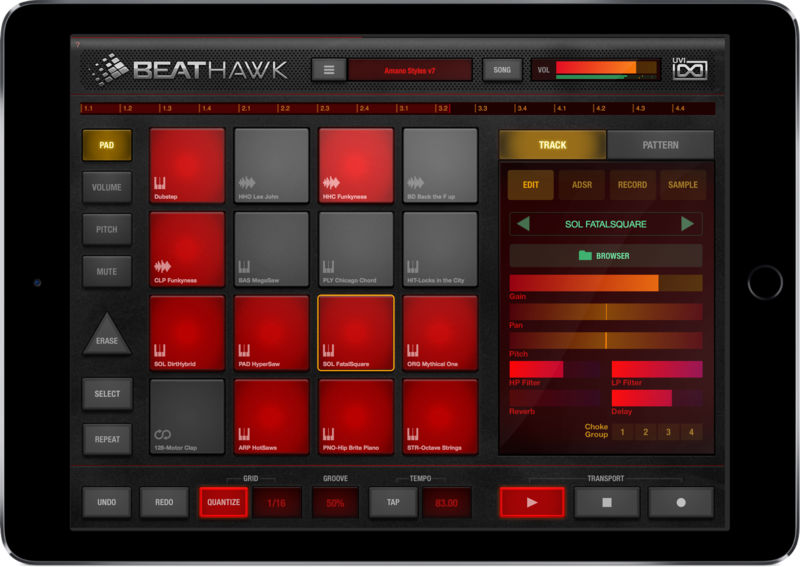 BeatHawk is a complete portable music production studio for iOS. 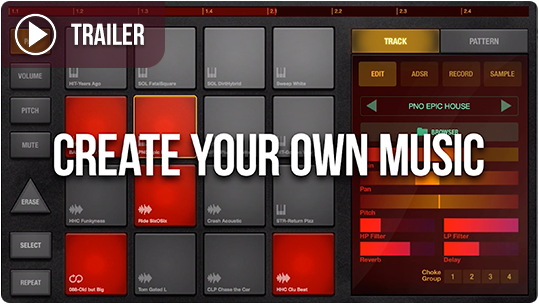 Create beats, sample, layer melodies, sequence, mix, arrange and perform songs with a blazing-fast workflow and sleek hardware-inspired user interface. It comes packed with high-quality UVI sounds, instruments and effects and was designed to help you get your ideas down fast. 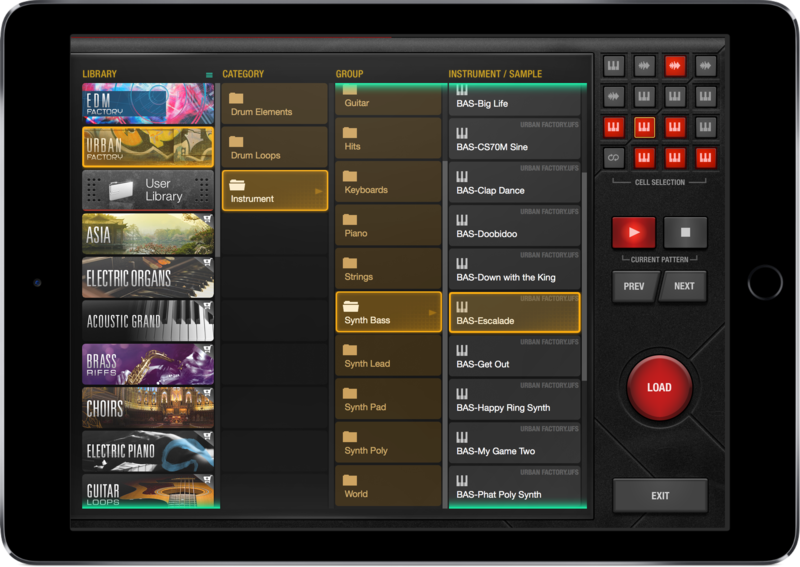 With comprehensive support for MIDI, Ableton Link, Inter-App Audio, Audio Unit v3 Plugin, Audiobus, AudioCopy and WIST, along with in-app export of mix, stems, MIDI tracks and Ableton Live project files, BeatHawk is a powerful and versatile addition to your mobile music-making rig. Built on the UVI Engine™ BeatHawk delivers extreme sonic fidelity rivaling that of desktop products used by professional studios and musicians around the world. All of BeatHawk’s sounds, instruments, effects and rendering algorithms have been designed and optimized to put the professional quality of UVI software into a lightweight and fun performance-oriented package. 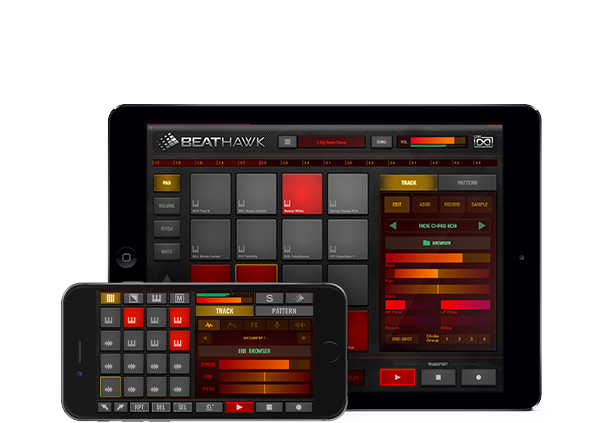 BeatHawk combines the speed and ergonomics of hardware with the power and flexibility of software to create a fast and intuitive music creating experience. Enjoy an uncluttered and lightning-fast workflow that helps you get your ideas out quickly, efficiently and sounding great no matter where you are. BeatHawk comes with two factory libraries including sounds and instruments, but for those of you who need more you'll find an ever-expanding selection of downloadable libraries. Multi-sampled instruments, drum kits, phrases and more are available whenever you need them directly from the in-app sound browser, all with the outstanding sound quality UVI is known for. 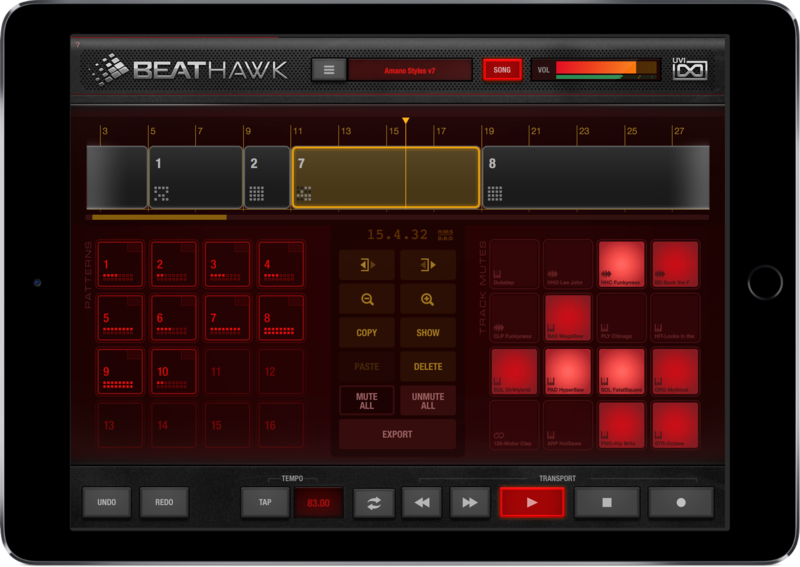 Possibilities are limitless as you can also import your own sounds within BeatHawk! Brimming with the sounds of house, techno, DnB and dubstep, EDM Factory delivers a modernized sonic arsenal capable of producing everything from deep dance floor epics to downtempo electronica jams. Includes a sizable selection of genre-correct drum kits, samples, loops and instruments all mastered to perfection. Jam packed with classic and modern drum machine samples, kits, loops, and dozens of instruments including basses, synths, guitars, pianos, strings and more, URBAN Factory gives you all you need to produce in a wide range of urban music styles with punchy and pristine sounds that effortlessly sit in the mix. Have your own sounds and samples you’d like to use? BeatHawk’s got you covered with full support for MP3, WAV, AIF, FLAC, and M4A. Import your sounds from your favorite cloud storage or via AudioCopy. Manage and arrange your library however you want with BeatHawk’s convenient browser. For those that want to dig deeper we’ve included a wide selection of affordable expansion packs covering everything from genre-specific titles like Trip Hop, Funk and Atlanta Urban to instrument and region-specific titles like Acoustic Grand, Asia and Vintage Blues Guitar, giving you fuel no matter where your inspiration leads you. Used on more hit records than any other drum machine in history, 8o8 delivers the iconic sounds of a studio legend in fully-mastered, precision glory. Deeply sampled and raw, brimming with low bass thunder and punchy hits, 8o8 puts the regal sound of this magic box at the center of your portable studio. House, techno and acid legend, the 9o9 is the mostly-analog drum machine heard on numerous genre-defining electronic music classics from '80s Detroit and Chicago to modern-day bangers. Get the authentic club sound, now available as a fully-mastered selection of kits, hits and loops. From coast-to-coast to global phenomenon, the '90s was the golden age of hip-hop. Inject some of that raw attitude into your tracks with era-specific sounds, from early lo-fi digital samplers to analog drum machines and synths, even down to the signal chain and processors used, it's all here. Put the squeeze on your next track with this European delight. From bright and festive to brooding melancholy the Accordion's complex tones are sure to add a unique flair to your productions. Includes a huge selection of expertly performed and recorded accordion phrases and fully playable instruments. Nothing adds punch and energy to a track like acoustic drums! A huge collection of deeply sampled professional acoustic drums gives you everything you need to make your own beats from straight and steady rock to funk. Multi-sampled single instruments with round-robins provide a natural and expressive sound. Experience the majesty of a Steinway Concert Grand Model D piano recorded in one of Europe's most prestigious sound stages. A studio-grade multisampled instrument with exceedingly lush detail and natural dynamics, Acoustic Grand delivers the superb details, graceful warmth and amazing range of this truly stunning instrument. Layer the rich and diverse sounds of the cradle of humanity into your productions as you explore the primal rhythms and rich melodies of the African people. Includes a huge selection of authentically performed loops and phrases as well as fully playable Balafon and African Guitar. Add the energy of analog synthesis to your tracks with this collection of lead sounds from 30 different classic keyboards. Expertly programmed and sampled through an exquisite signal chain, these sounds pack the authentic analog mojo of some of the world's most acclaimed hardware synthesizers. Explore the sonic heritage of the Far East as you play the mezmerizing strings, transcendent flutes and rich percussions of the orient. Includes authentically performed and expertly recorded regional instruments such as the Koto, Shakuhachi, Shamisen, Topshur, Lamellophone, Taiko and more. Sink your teeth into some southern heat with this blend of deep basslines, driving rhythms and popping synths that traverses the modern ATL landscape of hip hop, trap and crunk. 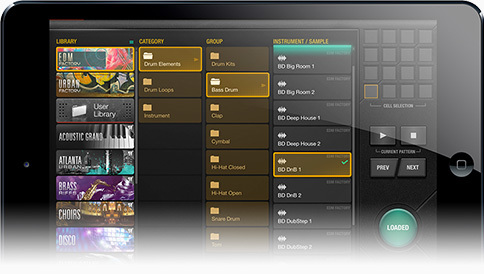 Includes a giant selection of drum kits, instruments, samples and more. Unlock the keys to Jazz, Blues, Soul and Worship music in your productions with the big daddy of all organs, the B3. This expansion delivers the unmistakable sound of the B3 with rotary speaker, fully restored and recorded to perfection. A rich musical tradition inspired by the music of the Balkans sounds of complex rhythm and incredible harmony. Includes a huge selection of authentically performed phrases as well as fully playable regional Accordion, Double Bass, Saxophone and Violin. Create classical-inspired riffs or jam in your own territory with the shimmering tones and timeless sounds of Baroque-era music. This quintessential collection includes exquisitely performed and recorded Celesta, Classical Guitar, Harp and Harpsichord. Available in multiple playing styles. Journey to Brazil with this fantastic tribute to the Bossa Nova sound of the '50s and '60s. A perfect way to add the flair and energy of samba and jazz to your tracks. Includes a huge selection of authentically performed and beautifully recorded loops including Bossa Nova percussion, guitars and bass. Add the power and splendor of Brass to your productions with this beautiful selection of fully playable ensembles. Includes exquisitely sampled French Horn, Trumpet and Trombone ensembles available in both Sustain and Staccato playing styles. One of Western Europes most well known folk traditions comes alive as you explore the music of the Celts. Includes a huge selection of authentically performed loops as well as fully playable regional instruments such as Bagpipes, Bombard, Irish Flutes and Celtic Guitar. The ethereal sound of the human voice in choir form has a timeless beauty and musicality. A warm and immersive selection of voices are presented here, immaculately recorded in a choice European venue with the finest equipment available. Includes Children, Female, Male and Mixed choirs. Elevate your music with the transcendant and emotive tones of the church organ from Cathédrale Saint-Alain in Lavaur, France in this beautiful and awe inspiring instrument. Never has such a huge sound come from such a tiny device! Includes a variety of registers divided into Pedal, Soft, Plain/Tutti and Chord categories. Add the power and dynamics of orchestral percussion to your productions with this fantastic selection of gongs, drums, cymbals and auxiliary percussions. Includes a full complement of traditional instruments such as Cymbals, Gongs, Grand Cassa, Snares, Taiko, Timpani, Shakers, Tambourine, Triangle and more. Feel the heat of Cuba's rich musical heritage with this collection of authentically-performed loops. Afro-Cuban rhythms drive the pulse while Spanish guitar passages dance and weave in one of the world's most diverse and influential musical traditions. Created with UVI Falcon utilizing numerous synthesis techniques including wavetable, multi-granular and scrub, Deep Bass delivers raw, powerful and meticulously designed bass patches bristling with the movement and energy of analog circuits and the bite of digital precision. A huge library of construction kits, loops, instruments and samples dedicated to the classic disco sound of the 70’s and 80‘s. Infuse your productions with soaring strings, funky riffs and four-on-the-floor beats to get the party moving! Utilize pre-built kits or individual elements in any way you choose. A cornerstone of pop and rock music of the '60s and beyond, this expansion delivers 3 iconic and exquisitely recorded electronic organs with the immediate funk and authentic tone of the original instruments. Ready to play presets delivers the sounds of vintage classics from the UK, Italy and the Netherlands. The essential sound of tines, loved the world over and made famous in jazz, pop, rock and soul is yours with the Electric Piano expansion. Get an authentic and luxurious studio-quality sound of a Rhodes Mark II, meticulously recorded and gently processed for the ultimate in smooth, warm and soulful piano vibes. Harness the storm with this massive collection of synthetic drums, warped and gritty synths, powerful basses and futuristic samples forged to fire the floor. A huge palette of sounds perfectly suited for many genres of dance, all mastered to perfection to give your productions an immediate and electrified intensity. A massive collection of construction kits, loops, instruments and samples dedicated to the classic funk sound of the 70’s. Whirling synths, grooving guitars, sure-footed bass lines and funky beats abound. From upbeat and groovin’ to smooth and mellow, Funk delivers a timeless vibe. Explore the rich and diverse influences of Greek and Turkish musical heritage as you explore the ancient sounds of the Mediterranean. Includes a huge selection of authentically performed loops and numerous phrases as well as fully playable Baglamas, Bouzouki, Jubus, Oud, Saz, Tzouras and more. A diverse collection of phrases and loops covering a wide range of styles on both electric and acoustic guitars. Craft grooves in any key or tempo thanks to high-quality realtime stretching. Lay down lush 12-string strums, blues, rock and jazz riffs, twangy hometown vibes, trip hop, fx and more. Explore the microtonal sounds and polyrhythms of India with a rich and profound musical heritage that spans millennia. Includes a huge selection of authentically performed and exquisitely recorded samples covering the Sitar, Pungi, Ravanahatha, Papang, Percussions and Indian vocal phrases and ambiances. Add the nuanced and emotional sounds of symphonic pitched percussion instruments to your productions with this fantastic collection of immaculately played and recorded instruments. Includes fully-playable Crotales, Glockenspiel, Marimba, Tubular Bells, Vibraphone and Xylophone. This signature sound of the 60’s and 70’s is back, ready to infuse your tracks with a warm, buttery tape vibe and nostalgic tones sampled from the original tapes. Mello is a superb representation of its iconic hardware counterpart. Includes: Cello, Choir, Church Organ, Electric Guitar, Flute, Guitar 12, Organ, Piano, Section Brass, Strings, Vibraphone and Viola. Spanning from Morocco to Iran the musical traditions of the Middle East are ancient and its influence is felt throughout the world. Includes a large collection of authentically performed loops and phrases as well as fully playable Maghreb Violin, Lute and Persian vocal ambiances. These musical gadgets, toys and instruments are alive with character and brimming with nostalgia. Explore this wonderful selection of acoustic and electric gizmos including Animal Boxes, Melodica, Music Box, Boom Whacker, Glockenspiel, Toy Guitar, Voice Sampler, Toy Percussions and more. Old school meets new school with this generous collection of classics broken down by the expert hands of DJ Quartz. Each track is presented both as full loops and as individual scratch elements allowing you to create your own unique scratch progressions perfectly synced to match your track. Gold chains not included. A passion for life and love can be felt throughout this exceptional collection of instruments and loops dedicated to Europe's timeless and beloved gypsy style. Includes a huge selection of authentically performed loops as well as fully playable regional Flamenco guitar, percussions and vocal phrases. Add the resounding grace and beauty of orchestral strings to your productions with this collection of immaculately played and recorded ensembles. Call up emotional trills, lamenting drones, rich bass tones, delicate pizzicatos and more. Includes Bass, Cello, Viola, Violin and All Strings ensembles. Give your productions the human touch with the signature sounds of the talk box, robot voices and vocoded samples. Talk Vox goes everywhere from playful sci-fi to old-school West Coast hip-hop, g-funk and R&B-inspired vibes. Includes a wide range of samples, loops, phrases and fx. This sound library treads deep into the dark alleys of lo-fi, experimental sound known as trip hop. Dirty textures, cold ambience, and a brooding hollowness are almost tangible in this generous selection of drum samples, loops, fx and kits dedicated to the signature 90's UK sound. Beautifully detailed recordings put you front and center as you experience the power and excitement of commanding your very own symphony orchestra. Create powerful staccatos, huge runs, mezmerizing tremolos and beautiful sustains. Includes Complete Orchestra, Orchestral Brass and Orchestral Strings. The sound of tireless struggle, lost love and hard times resonate in this classic blues guitar collection. Hundreds of riffs, licks, phrases and transitions provide soulful and visceral building blocks for your jamming pleasure. 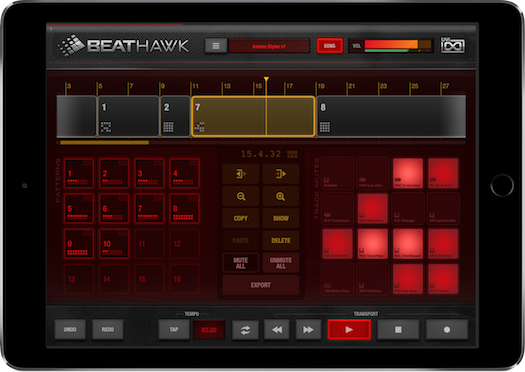 Covers a wide range of styles and tones, always in tempo and in tune thanks to the BeatHawk realtime time-stretch feature. Explore the best of the West in this testament to the sunny side's deep and diverse hip-hop culture. Stretching from San Diego to Seattle, from roots, golden age, g-funk to gangsta rap, you'll find the raw kits, bass and samples to give your production the real westside connection. Accentuate your music with the timeless and emotive sounds of Woodwind Instruments with this immaculately performed and studio recorded ensemble. The voices of Clarinets, Flutes and Oboes are yours to command and control with expressive nuance and gorgeous detail. With full support for Ableton Link, CoreMIDI, Inter-App Audio, Audio Unit v3 Plugin, Audiobus, Audio Copy and WIST, BeatHawk lets you create with all your favorite tools in whatever way you want. Jam with your friends, hook up an external MIDI keyboard, control parameters with MIDI CC, or even sequence from your computer. Mix, stems, MIDI tracks, Ableton Live project files, SoundCloud, YouTube, iCloud, Google Drive, OneDrive, AudioCopy; whatever you want and however you want it BeatHawk makes it easy to share your music or continue working on it later in your DAW of choice. 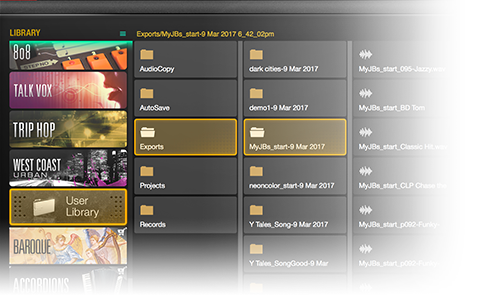 One-touch exporting and intuitive file management make integrating BeatHawk into your workflow second-nature. "UVI have done an excellent job with the v.2.0 release of BeatHawk. 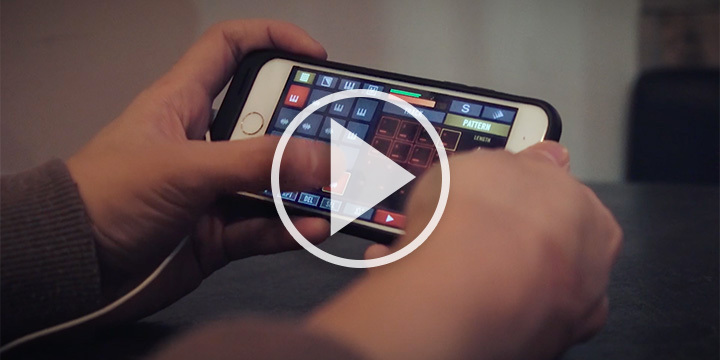 The array of new features have moved the apps forward in a number of ways and also bought it right up-to-date in terms of iOS music technology." 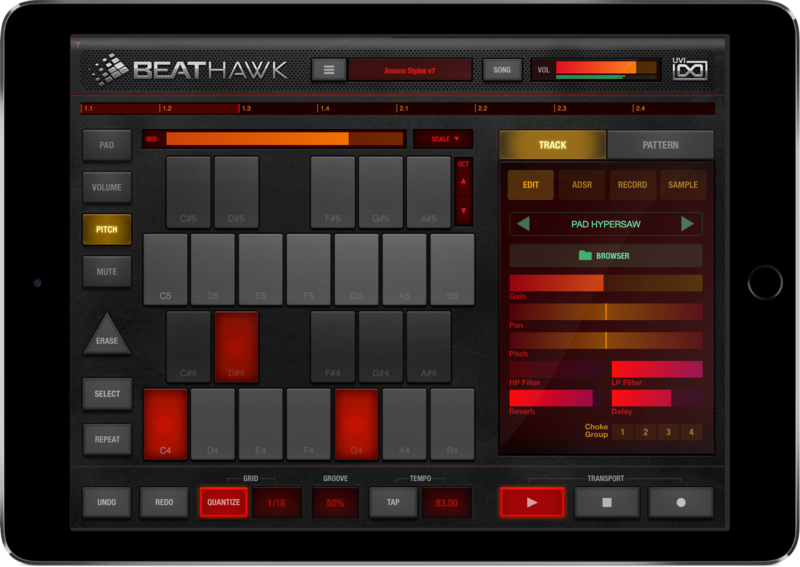 "BeatHawk is a solid tool for both song and loop creation that has a really nice assortment of included patches/sounds and drums that will definitely have your head moving to the beat. 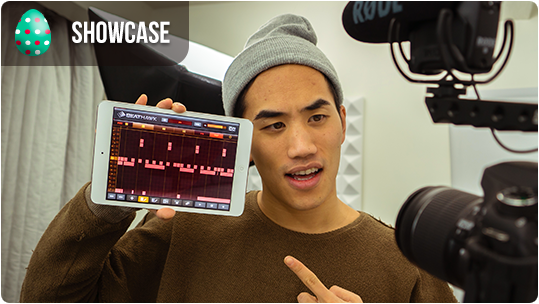 With Ableton Link, it’s a huge amount of fun, and I definitely think it’s going to be included in some of my future sessions." 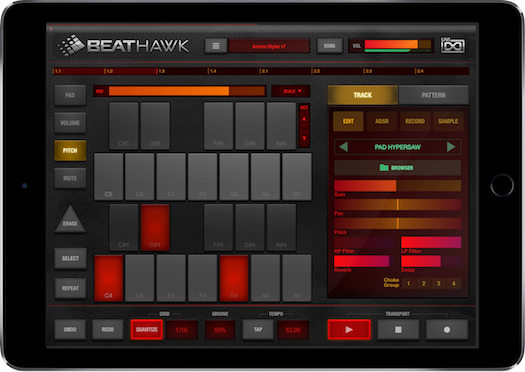 "If you’re an artist who finds inspiration in mobile production and brings those ideas back to your main workspace, BeatHawk 2 deserves a place on your iOS device. It is genuinely inspirational." "If you are not familiar with BeatHawk, I suggest you to get it 'cause it's excellent. It is easy-peezy to build stuff. It's such a cake building a song!" 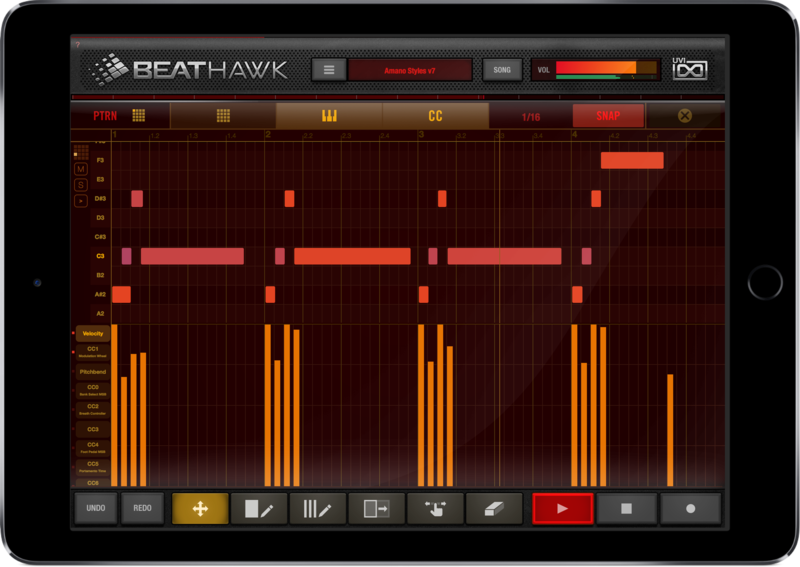 "BeatHawk looks like a great app for those that like jamming and sketching." "I was really surprised at how well it does so many things!"